Items with an Order button are IN STOCK to ship now! On this page we offer GREAT FALLS METALWORKS and AMETHYST'S FABIAN JEWELRY at DISCOUNT PRICES! Jan Palombo started GREAT FALLS METAL WORKS as a family jewelry business in 1968, now located in an old silk mill near the historic Great Falls of Paterson, New Jersey. Her daughter, Sarah Brothers, has taken over the designer role in the company. A small team of artisans craft the jewelry in the old mill from sterling silver and 14kt gold in designs abstracted from nature, colored by gemstones. The Fabian family of California has been making jewelry for many years, handcrafted with sterling, gold or goldfill and precious or semi-precious gemstones. Their business is named after the daughter Amethyst...aptly named after the beautiful purple gemstone known for spiritual healing and positive changes. Our collection below uses goldfill for chain and findings, briolette and rough cut stones in delightful arrays of color! To help you navigate, use the the LEFTHAND COLUMN LINKS to see other Outlet Pages, you can also view all the pages using the buttons below. Within each of those pages, use the DESIGNER LINKS BOX to see other work by this designer not in the Outlet Store. Sparkling 3mm rough cut CZ beads are light avocado green color (like vesuvianite), strung on flexible wire to form loop below sterling earwire. 2 inches long, about 1 inch across. 6mm WHITE TOPAZ briolettes mix with small faceted rondelles and WHITE FRESHWATER PEARLS for a 16 inch necklace on goldfill chain. All stones are wire-wrapped, this is a nice evening or wedding look too! Sparkling 3mm rough cut CZ beads are lemon yellow color (brighter than citrine), strung on flexible wire to form loop below sterling earwire. 2 inches long, about 1 inch across. A 2.5 inch long chandelier-style pendant swings from delicate goldfill chain, 15-18 inch adjustable length with lobster clasp in back. Pendant has GREEN GARNET briolettes and small stone at top. A BRANDY CITRINE is warm golden brown swinging above center, CITRINE briolettes at center and bottom in golden yellow. Smaller rough cut pieces in pendant are TOURMALINES of various color. 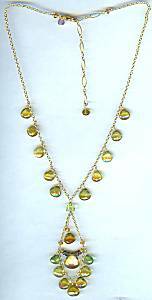 More of the 8mm CITRINE briolettes dance along front 6 inches of chain. Chandelier-style earring is about 1 inch wide, 2-7/8 inches long on goldfill leverback earwire. Has GREEN GARNET briolettes on side and smaller garnet at top. A BRANDY CITRINE is warm golden brown swinging above center, CITRINE briolettes at center and bottom in golden yellow. Smaller rough cut pieces in pendant are TOURMALINES of various color. Small 4mm faceted rondelles of CITRINE, BRANDY QUARTZ and APATITE mix with tubes of BROWN TOURMALINE, all are wire-wrapped to join into 16 inch goldfill necklace. 3/4 x 7/8 inch earrins of sterling wire that extends out to ball-shaped endings, also a SMOKY QUARTZ at center, another on one tip and PEARL on another tip. Post located at center. Read about what others think of Great Falls jewelry! Instead of reviews for a specific product, this is a place to share about the designer line in general. Read about what others think of Amethyst Fabian jewelry! Instead of reviews for a specific product, this is a place to share about the designer line in general. Lovely pale BLUE MIST CHALCEDONY is like mysterious ice in color, glowing more in the rose-cut 16mm teardrop shape. Set in sterling silver, rough cut stone accents are wire wrapped below earwire. 2 inches long. Sterling silver wire vine has "buds" of rough cut CARNELIAN stones and final briolette dangle, 2-5/8 inches long on earwire. Sparkling 3mm rough cut APATITE beads are pretty transparent turquoise color, strung on flexible wire to form loop below sterling earwire. 2 inches long, about 1 inch across. 12mm large square TURQUOISE cabochon has slightly domed top, a rich turquoise-green color with minor green inclusions. Briolettes and rough cut BLACK ONYX stones drip below. 1-3/8 inches long, a post is located 1/4 inch below top corner. Set in sterling silver. 1 inch long polished teardrop of VIOLET JADE is stunning subtle colors of blue and lavender translucence. Suspended from 17 inches of 7mm rondelles of the same stone (that look like a shimmering lepidolite in colors), sterling toggle clasp. Lovely pale BLUE MIST CHALCEDONY is like mysterious ice in color, glowing more in the rose-cut 16mm teardrop shape of necklace pendant. Set in sterling silver, rough cut stone accents on delicate chain. Pendant is 1-1/8 inch long, necklace 16 inches with spring ring clasp. 1-5/8 inch shiny sterling silver pin elegantly captures cabochons of blue colored stones. From large to small, they are AQUAMARINE, LABRADORITE, APATITE and AQUAMARINE. Barpin clasp. Sparkling 3mm rough cut AMETHYST beads are medium purple tones, strung on flexible wire to form loop below sterling earwire. 2 inches long, about 1 inch across. Pin is 1-5/8 inches across in graceful sterling silver shapes. Cabochons from large to small are SMOKY QUARTZ, IOLITE, GREEN QUARTZ and MOONSTONE.